Luckily, a slew of models, socialites, and artists including Mr. Brainwash (who enjoyed his own collaboration with both the gallery and hotel earlier this year) were able to make it swiftly past the throng of people at the velvet ropes. Inside, the Stones tribute spanned the entire third floor of the chic hotel, featuring art by band member Ronnie Wood, as well as handwritten lyrics, historic guitars, and one of only two of the bands Grammy awards. 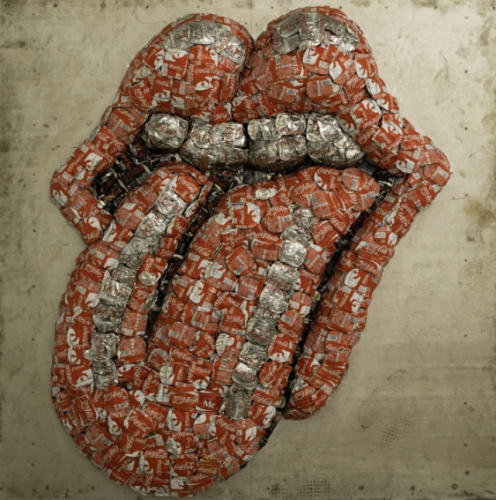 Pop artist Jumping Bull also contributed a giant replica of the classic tongue and lips logo, originally designed by John Pasche in 1971, constructed out of coke cans. If 1,000 people seems like a ghastly herd to fight your way through for a glimpse into the life and legacy of the Stones, we don't recommend making plans to visit their forthcoming exhibition, aptly titled "Exhibitionism" at Saatchi Gallery in London. The interactive show, which is slated to open on April 6, 2016, was created by the band themselves, and has been in the works for over three years. Saatchi is already touting the show on their website, and we're thinking the opening, which is likely to be feted by the likes of Mick Jagger himself, will redefine the meaning of the term "madhouse." Then again, what's rock n' roll without a massive line of screaming fans?